Referred to as the gentle giant of the VIP, Mrs Hodge-Smith spared no moment to call out the Dr D. Orlando Smith led National Democratic Party (NDP 1) for what she called “greed, arrogance, ignorance and even nepotism,” that has piloted the Virgin Islands (VI) into financial and political disaster. According to Mrs Hodge-Smith, “We have come a long way from the days when we were attracting proper investors… a long way down from the days when scholarships were more accessible to our children… long way down from the days when the roads were good and the sewer system worked,” she told those gathered at the Bandstand while highlighting the failures of the current NDP 1 government. “Our leaders, and I use that word loosely… have led us down to a dark, narrow and slippery path, they have undermined the foundation of the 70s and 80s,” she said, while noting that the VIP is fighting an ‘enemy’ who will use every trick in the book to keep the VI oppressed. “They want to divide and rule us, but we shall come together and fire them! We have heard the cries of the people that a change must come,” she said emphatically. “Ladies and gentlemen, our country is in a crisis,” she uttered, “The stench of corruption is unacceptable, the stench of incompetence is unacceptable, and the stench of wrong priorities is unacceptable,” she said. “For eight long years, you cried and complained… Unable to have steady running water to take care of your basic needs. To compound this issue, promises were made to fix it but to date, the water woes continue,” this is unacceptable, she echoed. “Ladies and gentlemen, the current representative, [Mark H. Vanterpool] is running scared… He is running scared because he can’t explain the overrun of the Pier Park Project. He is running scared because he and his friends cannot account for 15 million dollars taken from the Social Security Board,” and the neglect of the Elmore Stoutt High School (ESHS), she said. “Anybody who hires a man who turns around and don’t do what he is hired for, he gets fired. It’s time for a woman to do the job,” she implored. 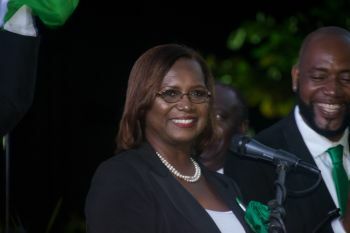 Mrs Hodge-Smith said as part of her plans for District 4, she will address the territory’s health and safety needs, improve the environment with the planting of trees and cleaning, repair infrastructure, execute senior citizen care initiatives and work on economic development in addition to representing the fourth district with integrity and humility. “So on election day… when you vote, vote to make a change, the change that you have been longing for. On that day, better you shall receive. You can no longer live in unacceptable conditions,” she told the people of Road Town. Wize up stop beating a dead horse! Really?? The VIP candidate talking about attracting investors? Isn't the VIP the "INVADERS ARE COMING" party? Incredible! Did Luce donate a pillow to the citizens of the 4th district after the 2017 floods? Where were these people when we needed them most? Okay okay okay...everyone can exercise their democratic right to seek political office. Go for it Luce! Wink! @ Wize up...let's play make believe for second and live up to your name. I just asked two simple questions about the aspiring district 4 representative. Don't be a wise acre now! People of all 9 districts go out in droges to take out the NDP 1 and NDP 2 don't stay home because if you do those who is behind the Parts will make them win. Don't say you want them out and you are not going to the polls to vote them out. Please, Please go out and take them out. Them did enough wrong to this little country and now it is time for us the people to take action on them send them in the opposition to sit down for the next years to come. Mark has a lot of mouth and he was there and he help make mess in this place don't let his big mouth fool you he is running scared for real. When you go to the polls to place your X remember it is not an X it is an empty circle which you have to shade in please don't spoil your ballots. If that is all her plans for road town mite as well she hold a seat. especially when she spoke some week ago about the Market Square which was directly under her portfolio. VIP team is WEAK. Educated people YES, but the team is TOO WEAK to take us out of this MESS!!! If VIP is to weak to get our Territory to move Foward, who then will do it? I can't imagine that the people that got us in this Mess is going to either. Infact if people refuse to remove blinders and put them back in...May Jah help Us All! Luce whoever wrote that speech is a DUNCE.. you want an explanation for pier park overrun ask claude he in your party, remember his private secretary was getting a hefty salary plus her MAN was getting all the contracts at the park... you mentioned WATER ISSUES:It was under the VIP government "Fraser" awarded a contract to a bankrupt company to provide us with water and with the hefty payout clause the NDP had no choice other than to continue with it...Sewer ask Malone who is in your TEAM VIP, and with the growing number of buildings going up in this country the sewer will only get worst the planning infrastructure for the sewer was a problem that the government of yesteryear created because the was no vision to see the BVI would have come like this now we blaming one specific political party you should have told your audience the amount of time you will take to address all the issues in the 4th then you would have had a great chance but instead you was busy talking about what he didn't do from what he did....Flooding in Road Town Incase you memory lost Road Town is reclaim land and is only so much water the earth can take because water is always at the bottom luckily here in the BVI we don't have rivers gushing down when it have heavy rain else we would be looking for people and buildings all now for (e.g) Dominica,St.Lucua,St.Vincent and Trinidad.. when water start reclaiming its property there is nothing no one can do to stop it water will always damage any low point that's why when a flood warning is issued them always make it clear people in low line areas should move to higher grounds...Luce ask Andrew where the funds from Queen Elizabeth bridge? By water? The traffic light in the roundabout? Green house? Purcell Johnson ghut bridge? The contract that was signed to give the rep of the 3ed district brother money in he pocket? Why he lowered the school system? to fool the young people make them feel like they was doing that great...why he didn't put claude on the team but have him on podium? Why he does go around in the other districts outside of election... Luce I challenge you to bring Andrew to the ghetto...Luce you trying to push your foot in a big shoe but it will squeeze you. Luce on the loose, more to come. We voting Luce and the VIP team all the way. The 4th district is no longer Long Bush and Lower estate, We coming t6ogether to vote out Mark Vanterpool.